My 3-year old daughter loves Dora the Explorer. She thinks that bossy little know-it-all, Dora, is really cool. She used to be frightened of The Swiper, but that changed as she grew older. Last night, I sat her down in front of a laptop and let her watch an episode of Dora on YouTube. 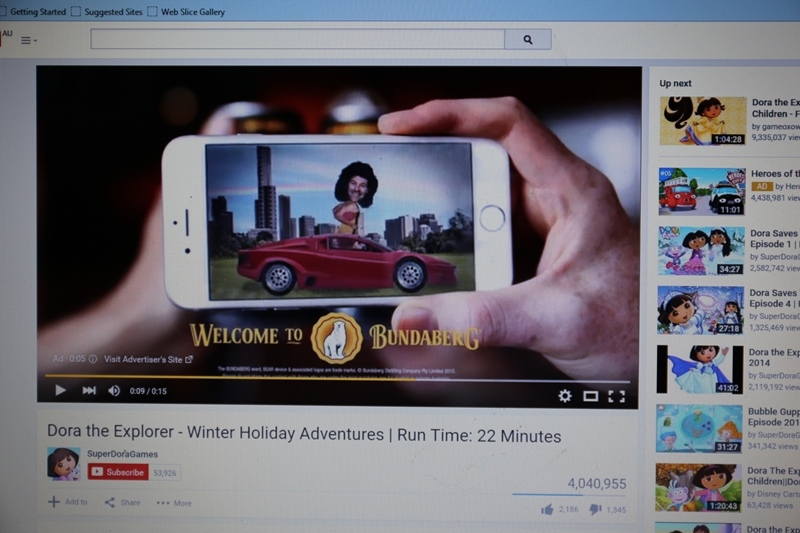 Right away an ad filled the screen for Bundaberg Rum. Bundaberg Rum is a brand owned by Diageo Australia. All of this happened mid-evening, before 9pm. This is the reality of alcohol advertising in Australia. 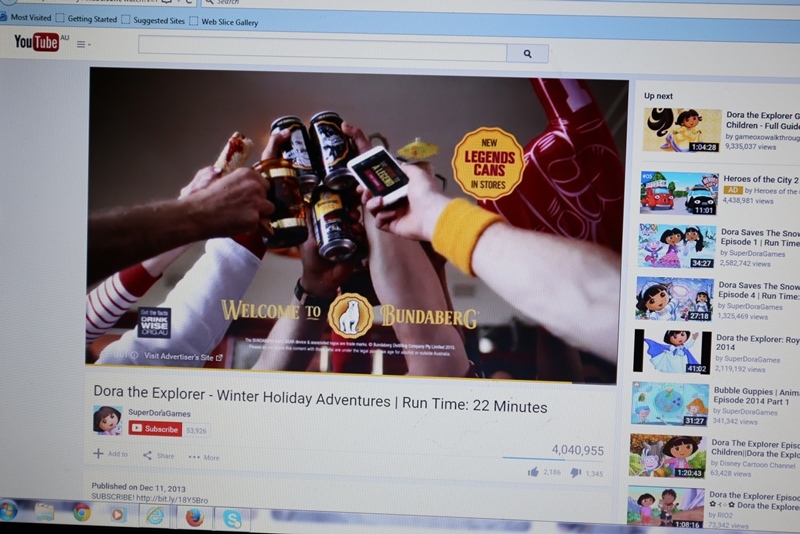 Liquor ads, bought and paid for by Australian drinks manufacturers, streamed online with children’s content. It’s not unlawful. It’s business as usual. This is the kind of thing the Alcohol Advertising Review Board draws attention to in its latest report. A product review by a 12 year-old for Vodka Cruiser Pineapple Passion Punch 2L, on the Dan Murphy website (owned by Woolworths). Johnny Walker and Smirnoff ads screened in cinemas before “Minions” – an animated film, rated PG. Alcohol ads plastered over bus stops outside schools (see p 17 of the report). And so on. If you don’t want your pre-schooler exposed to liquor ads while watching age-appropriate material online, what are your options? The ABAC Code and complaints scheme are not legally binding, but members of the Brewers Association of Australia and New Zealand, the Distilled Spirits Industry Council of Australia and the Winemakers’ Federation of Australia are signatories. The ABAC Code places few real constraints on signatories, but it enables the alcohol industry to claim that alcohol advertising is regulated responsibly, at no cost to government. Which would be great, if it were true. The ABAC Code places no restrictions on the placement of an alcohol advertisement. If you’re a drinks manufacturer who wants to advertise on the internet – including on websites that carry or are even devoted to children’s content – the ABAC Code has no problem with it. For example, when Crown Lager ads appeared on a “Bratz” games website (and check out the URL to see what I mean ), the complaint was dismissed because the ABAC Code was designed not to apply to the placement of alcohol ads. An independent complaints scheme, the Alcohol Advertising Review Board, points out the limitations of the ABAC, and administers its own Codes, with help from a panel of lay members located around the country. The Content Code is constructed from provisions in existing alcohol advertising codes from around the world. The Placement Code, however, “features provisions by which the Board considers the placement of alcohol advertising should be governed”. Alcohol Advertisements should not be placed: (i) in places or at broadcast times where Young People are exposed or are likely to be exposed; or (ii) in connection with content that appeals to Young People. Alcohol Advertisements shall not appear online in connection with content that appeals or is likely to appeal to Young People. As a parent, those constraints appear entirely reasonable to me. By the way, you have to love the “Drink Wise” logo in the second screen shot above. You probably missed it. After all, it was designed to be missed. 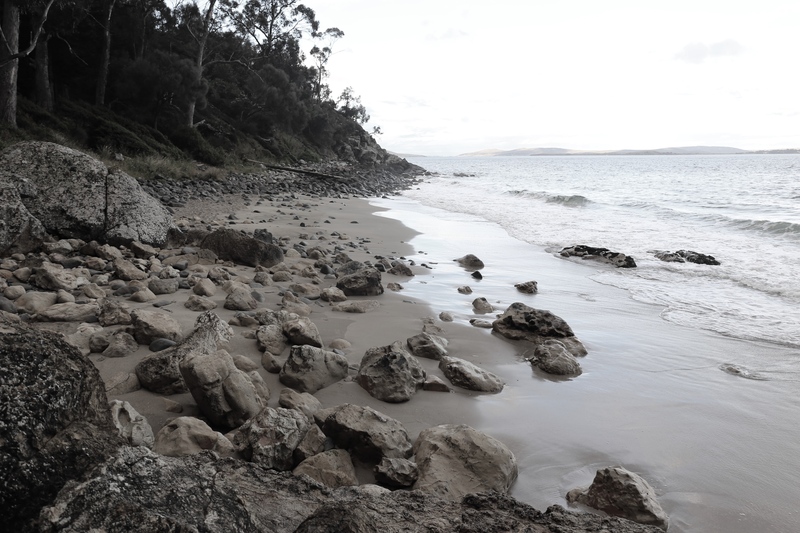 For further comment on this in the Sydney Morning Herald and Fairfax press, click here. A Fairfax video reporting on this blogpost, containing the images included in this post, has now been added to YouTube. AdNews has reported that Diageo has suspended all media across the YouTube platform while it investigates the matters raised above. This incident provides an interesting opportunity to test the limits or otherwise of the ABAC Code. Accordingly, I have submitted a complaint. Are you interested in studying health law? For further information on Sydney Law School’s Master of Health Law and Graduate Diploma programs, follow this link. New York City’s Board of Health last week unanimously agreed to require ‘salt-shaker’ warning symbols on menu items with more than an entire day’s recommended limit of 2300mg of sodium. That’s around one teaspoon of salt. Restaurants with more than 15 outlets nationally will display warnings from 1 December 2015. Warning: the sodium (salt) content of this item is higher than the total daily recommended limit (2300 mg). High sodium intake can increase blood pressure and risk of heart disease and stroke. Industry groups and the National Restaurant Association have been as swift in their (predictable) opposition as public health advocates have been to welcome the move. The Center for Science in the Public Interest has even begun a Pinterest board of qualifying items – a salt shaming parade of sorts. Surrounding public debate has renewed attention on the health impact of salt. Sugar may have received more publicity of late, but population salt reduction is a World Health Organization ‘best-buy’ for public health. Cardiovascular disease is now the world’s biggest killer, and high blood pressure the leading risk factor for these deaths. Links between salt and high blood pressure are so well established that in 2011, countries agreed to pursue a 30% relative reduction in population salt intake, aiming towards an average of less than 5 grams a day (approx. 2000mg of sodium) by 2025. In Australia, a 30% reduction could save around 3400 lives each year – that’s three times the national road toll. Many are aware of salt’s potential harms, but it appears most people are failing to personalise their own risk – and thereby failing to modify their behaviour accordingly. New York’s measure is built on figures that just 1 in 10 Americans are abiding by current guidelines. Most Australians aren’t aware of the daily recommended amount, yet believe their own intake of salt to be ‘about right’ (spoiler: it’s not!) People may not realise around 75% of salt intake comes from processed and restaurant foods – making it hard for even motivated individuals to reduce consumption alone, particularly without user-friendly information available on labels or menus. Ironically the source of the problem is not the salt-shaker itself. Not the one you keep at home, anyway. Introducing a warning icon is a step in the right direction. Graphic and simple, it aligns with growing evidence from a packaging context that interpretive labelling helps consumers make healthier choices. Such measures also have broader impact by driving reformulation. 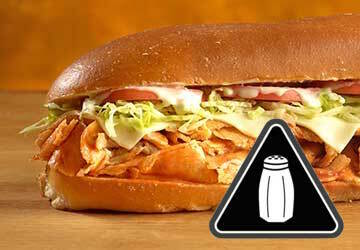 If you were the maker of Jersey Mike’s Buffalo Chicken Cheesesteak – currently containing an astounding 7795mg of sodium – would you continue to invite adverse publicity via online ‘worst-of’ lists and in-store warning labels, or instead dial down salt, perhaps even phasing out the item from sale? Reformulated recipes rolled out by national chains may benefit millions of fast food customers far beyond New York City. Even before the potential ‘domino effect’ when emboldened health authorities elsewhere copy the measure, the little salt-shaker icon could have significant flow-on effects. But what is an amount of salt worth warning us about? Burger industry representatives have been quick to proclaim most burgers in NYC wouldn’t be slapped with warnings under the current threshold. One whole teaspoon is a high bar if applied only to individual items. If a similar measure were applied in Australia, we may not see too many salt-shakers appear, though KFC’s Zinger Stacker burger comes dangerously close. Thankfully the law also applies to advertised meal combinations – in case you needed it, one more incentive not to ‘super-size me’. Perhaps an entire day’s total is still an unreasonably high benchmark. If we allow food companies to market packaged foods as a ‘good source’ of positive nutrients like protein or fibre when containing just 20% of the daily recommended intake, and an ‘excellent’ source at 50% – why not apply a similar metric to a warning when the reverse is true? Even if items don’t qualify for a salt-shaker, few would argue most products sold by these chains are ‘good for you’. Some point to limitations of focusing on single nutrient warnings, but such critiques miss the intervention’s place as only one component of a suite of complementary measures (including voluntary salt reformulation programs and trans-fat bans) which operate together to improve the food environment and enable consumers to make healthier choices. In NYC – just as in New South Wales – total energy content is already displayed for all menu items. Results from NSW have been encouraging: the Food Authority found a 15% decrease in average kilojoules purchased. Despite a recent high-profile breach by McDonalds’ on its new digital menu boards, compliance has generally been high. Laws exist only in NSW, South Australia and the ACT, but many national chains have rolled out kilojoule information nationwide, delivering benefits to countless Australians. As NSW considers extending menu labels to cover additional nutrients, New York’s salt-shaker provides global leadership. Perhaps better still, Australia has already developed a system combining information on a variety of risk factors (salt, sugar and saturated fat) with positive nutrients and total energy content into a single interpretive symbol. If ‘Health Star Ratings’ prove popular on front-of-pack of packaged foods in our supermarkets, why not extend them to fast food? New Yorkers’ had a Nanny. Do Australians have one too? Earlier this month, Senator David Leyonhjelm announced aSsenate inquiry into legislative and policy measures introduced to restrict personal choice “for the individual’s own good,” including laws related to tobacco, e-cigarettes, alcohol, marijuana, bicycle helmets, and film classification. Leaving to one side the irony of a government inquiry into government’s unreasonable interference in our lives, many of the products to be considered by the inquiry are of central concern to public health. Smoking remains Australia’s largest preventable cause of death and disease, responsible for some 15,000 deaths, and costing Australia $31.5 billion in social and economic costs annually. Alcohol is linked to over 60 different health conditions, and accounts for around 3430 deaths per year. Public health advocates call for a strong government response to these health problems, because preventive measures are more cost-effective than treatment, and because legislative and policy measures work. Laws and regulations concerned with restricting the sale or promotion of cigarettes and alcohol are often seen as examples of the “Nanny State” in action, i.e., unwanted government interference in what should be our own, freely-made choices. But it’s wrong to frame these measures simply as the state acting “for the individual’s own good.” Governments have a legitimate interest in ensuring population health, and in preventing the healthcare costs associated with alcohol and tobacco consumption. So too do we, as taxpayers. Governments also act a check on the powerful corporate interests that have a profound influence on our drinking, smoking, and eating habits. We might as well ask, why isn’t there an inquiry into Big Tobacco and Big Alcohol, and their impact on our freedom to live healthy, productive lives? It’s possible for governments to overstep their boundaries, and to introduce measures that are overly paternalistic and completely out of step with community needs. But by adopting the prejudicial language of “personal choice” the Senate inquiry seems to have closed itself off already to the kind of useful debate that we might have about the role of the modern state in protecting population health. Perhaps the inquiry should consider a new collection papers published in the journal Public Health under the heading “Who’s afraid of the Nanny State? Freedom, regulation, and public health.” This special issue explores and unpacks the meaning of the Nanny State rhetoric so beloved by Senator Leyonhjelm, drawing upon work by academics from a variety of disciplines. It offers new ways to conceptualise the role of the state, and highlights the vast array of tools available to governments when acting to protect public health. Don’t be fooled by the rhetoric. Laws and policies on bicycle helmets, cigarettes, and alcohol save lives. And they do so in a much less intrusive way than chemotherapy for lung cancer, a liver transplant, or surgery for traumatic brain injury. In a move likely to upset the pro-vaping brigade, NSW has substantially strengthened the regulation of e-cigarettes. The Public Health (Tobacco) Amendment (E-cigarettes) Act 2015 (NSW) [“E-cigarette Amendment”], applies to e-cigarettes and e-cigarette accessories, regardless of whether they contain nicotine. It extends a number of existing tobacco controls to e-cigarettes. As first introduced, the government’s Bill was an exercise in minimalism [OK, tokenism], doing nothing beyond prohibiting the sale of e-cigarettes and e-cigarette accessories to persons under the age of 18 – unless it was an “authorised product” (essentially, a nicotine cessation product) (s 22). Following amendments, it will now be unlawful to purchase e-cigarettes on behalf of minors (s 23), and as with tobacco products, police officers will have the power to seize e-cigarettes from minors (s 26). In addition, the E-cigarette Amendment creates an offence for using an e-cigarette in a motor vehicle when persons under the age of 16 years are present (s 30). It extends restrictions on the advertising and promotion of tobacco products to e-cigarettes (s 15A, affecting ss 16-21). These include prohibitions on e-cigarette advertising, prizes and gifts, free samples, sponsorships and shopper loyalty programs. The E-cigarette Amendment picks up amendments proposed by both the Labor opposition and the Greens. However, the government has refused to extend the provisions of the Smoke-free Environment Act 2000 to e-cigarettes, despite a Newspoll survey showing 70% support for this. 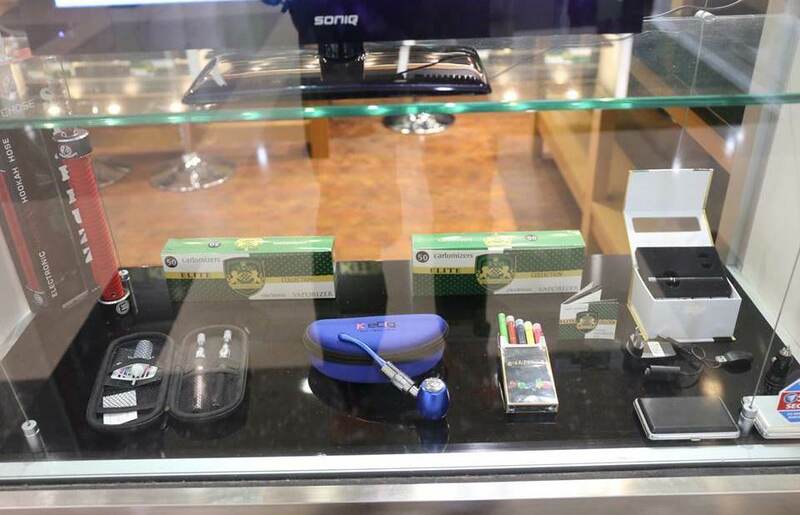 E-cigarettes: coming to a restaurant (or childcare centre) near you? According to NSW Health Minister Jillian Skiner MP, the government’s e-cigarette legislation seeks to find a balanced policy response that “mitigates risks but does not exclude the potential for electronic cigarettes to act as a smoking cessation device” (communication from the Hon. Jillian Skinner MP, Minister for Health, 13 April 2015). As a result, and subject to discussion of poisons legislation below, NSW law does not prevent users of e-cigarettes from getting their nicotine fix on trains and buses, in school, university classrooms, child care centres, hospitals, shopping centres, museums, theatres and cinemas, restaurants, bars and cafes, and…Parliament. Ironically, Greens MP Jeremy Buckingham was called a “disgrace to the place” by a government MP when he vaped an e-cigarette in Parliament to draw attention to these omissions. Ouch. Although data are limited, it is clear that e-cigarette emissions are not merely “harmless water vapour” as is frequently claimed, and can be a source of indoor air pollution. Smoke-free policies protect nonsmokers from exposure to toxins and encourage smoking cessation….Introducing e-cigarettes into clean air environments may result in population harm if use of the product reinforces the act of smoking as socially acceptable or if use undermines the benefits of smoke-free policies”. In contrast to NSW, amendments to Queensland’s Tobacco and Other Smoking Products Act 1998 (Qld) expand the term “smoking” (as defined in the Dictionary of the Act) to include the use of an e-cigarette. E-cigarettes are defined as “personal vaporisers” and related products in the Qld Act. As a result, the prohibitions on smoking in “smoke-free enclosed places”, “smoke-free motor vehicles”, and “smoke-free outdoor places”, also apply to using e-cigarettes in these places. Is possession, use and sale of e-cigarettes lawful? To the extent that they contain nicotine, the E-cigarette Amendment does not legalise possession or sale of e-cigarettes in NSW. Nicotine is a poison and is regulated in Australia under the Standard for the Uniform Scheduling of Medicines and Poisons (SUSMP), a federal standard that has been incorporated into State and Territory Poisons Acts. State legislation treats nicotine differently according to whether it is intended for “human therapeutic use” (eg it is a quit smoking aid), or whether it is a recreational nicotine product – in which case it is regulated under Schedule 7 of the Standard. In NSW, the Poisons and Therapeutic Goods Regulation 2008 (NSW) reg. 20 provides that a person cannot obtain or use recreational nicotine (ie nicotine not for human therapeutic use, veterinary use, or in a smoking product), nor can recreational nicotine be sold unless the person holds an authority under Part 8 of the Regulations. The evident purpose of these provisions is to forestall the creation of a market for new forms of recreational nicotine. Currently, the sale of e-cigarettes or cartridges containing nicotine is unlawful in NSW. A separate issue is raised by s 21 of the Public Health (Tobacco) Act 2008 (NSW), which creates an offence for selling any “toy, amusement or other product that resembles a tobacco product or is packaged to resemble a tobacco product”. A similarly-worded provision in WA led to the prosecution of an e-cigarette retailer who was selling non-nicotine vaping products. The case is Hawkins v Van Heereden  WASC 127 . Van Heereden was fined $1,750. For more detail on the legal regulation of e-cigarettes in Australia, see this paper by Healther Douglas, Wayne Hall and Coral Gartner. So what position have we reached with e-cigarettes in NSW? Let’s summarise. In defending the decision by the Baird government not to extend smoke-free legislation to e-cigarettes, NSW Health Minister Jillian Skinner has said that the “jury is still out” on whether e-cigarettes might function as a harm minimisation or stop-smoking aid. No one is seriously arguing that the vaping community is sucking away on nicotine-free e-cigs; in fact, it’s reasonable to assume that the appeal of these products lies partly (if not wholly) in their capacity to relieve nicotine cravings. Rather oddly, it seems that that’s OK with the NSW government, notwithstanding its own poisons legislation. If evidence shows that e-cigarettes are an effective quit smoking aid, it is not beyond the capacity of legislatures to authorise their supply and use by established smokers. Appropriately so. But that’s not what the vocal vaping community want, less still e-cigarette manufacturers (and the tobacco giants that are stalking them). The latter want to expand the market for recreational nicotine use. That’s how they’ll make money. The merits of creating such a market is the issue that legislatures around the world are currently facing. Here’s a scenario for you. You go out to dinner and score a seat close to a couple who are vaping up a fog at the table next to you. Or your 3 year old starts playing with the electric shaver-sized vaping thingo the childcare worker was sucking on but left in the playroom by mistake. Or Jeremy Buckingham starts disgracing himself again in Parliament. Oh, the disgrace. These scenarios don’t seem all that far-fetched, given the mixed signals the NSW government is sending out on e-cigarettes.